The Lingua File from TLF Translation: Language's Biggest Challenge: How Do You Define Left and Right? Language's Biggest Challenge: How Do You Define Left and Right? I was watching an old episode of QI (a fascinating show for those who haven't seen it) when the question of defining left and right to an alien species came up. The general consensus is that you cannot define left and right due to the relative nature of the concepts. Surely, that can't be right. Right? The reason these concepts are so difficult to define is because they are relative. Put simply, you can't really have left or right without having some reference point. "on, towards, or relating to the side of a human body or of a thing which is to the west when the person or thing is facing north." "on, towards, or relating to the side of a human body or of a thing which is to the east when the person or thing is facing north." 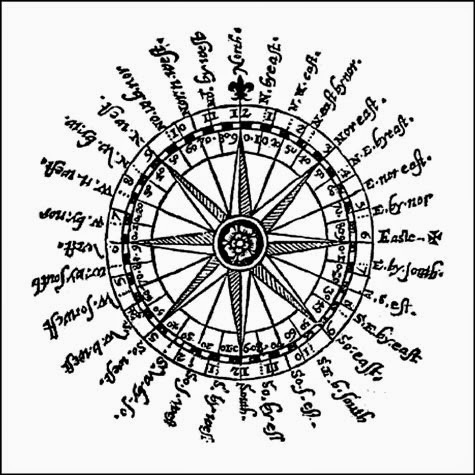 A compass provides a fine example of cardinal directions. While left and right are seemingly simple for most of us to understand, around 15% of people seem to struggle with left and right, suffering from a condition known as "Left-Right Confusion". Can you really blame those who can't tell the difference? The terms are so useless in practice that "my right" is only "your right" when we're facing the same direction. This makes left and right egocentric directions, as their definition is based on the self. While both up and down are also egocentric, thanks to gravity, their definitions are often universally understood. This is thanks to everyday life, where gravity is almost always found to be pulling us back to our home planet, Earth. The relative nature of these terms means that in geometry and physics, left and right aren't even bothered with. The Cartesian coordinate system puts matters into numbers, which is often preferred by the hard sciences, rather than the subjectivity preferred by human languages. However, there are a number of languages and communication systems that don't use the concept of relative direction like left and right. The Guugu Yimithirr Language, which is natively spoken by around 100 aboriginal Australians, seemingly has no time for egocentric directions, preferring a system of cardinal directions to describe the location of objects. While I feel like I know more about directions, both egocentric and cardinal, I certainly wouldn't feel confident giving directions to aliens. How would you describe left and right? Tell us in the comments below.